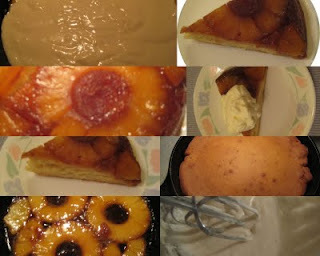 Update on Pineapple upside down Cake : Finally I managed to upload the pics, and also I realized that I didn't took the picture of whole cake, I told you, I love this cake so much that only thing I can think of, while sitting in front of this cake is EATING IT. But I surely got some pictures of the whole process, though they are not very clear, but I wanted to share with you all. Also one more thing DH thinks I used too much sugar for caramel but to me it was perfect specially when eaten with whip cream(point to be noted I made that cake for me, after a long time), so I guess sugar for caramel can be further reduced to 3 tblsp. One more thing I wanted to add for vegan version soy butter can be used instead of regular one. Now let's come to today's post Cranberry chutney/sauce/salsa or whatever you like to call it. Heat little oil in a heavy bottom pan, saute onions for 2 min. or so then add rest of the ingredients. At this point only add 4 oz. of water. Mix everything together, cover & let it cook on med. for around 15 min., stir in between. Add more water according to the consistency you like, I kept this one little loose like salsa kind. Once the apple & cranberries are cooked(they'll be mushy) it's done. Serve it with with your choice of bread, roti, rice, as chips dip or as a sauce for grilled meat or seafood. I enjoyed it eating just like that, with nothing.So, go and grab these fresh berries before they disappear from store shelfs. As for me, I'm gonna make little extra this time & try to freeze it for later use. 1) Radhika & Sudeshna's Food for 7 Stages of Life - Kids(4-14 yrs.) . 2) Yasmeen's Helath Nut Challenge 3 : Healing foods . 3) Sharmi's CFK- Veggies & Fruits. 4) On Sanghi's suggestion I'm sending this cranberry chutney as well as Pineapple upside down cake for her FIL-Fruits event. I'm dedicating the cake to my DD as I love to bake for her, she love cakes and specially after eating this one she said this is the most tasty & soft vanilla cake she ever ate. And as far the cranberry chutney is concerned I dedicate it to my Mom who's the inspiration behind my cooking. Agree, this is much more healthy and hardly any guilt while eating this. I liked the idea of adding apples to give it sweetness.